I never though you could ever top TKIOF but I love Psalms as much. I don't know yet what to expect with Trinity but even if it is like the last two, I will love it. I will never get bored with your music. And trying to pick a favorite is like trying to pick a favorite Black Sabbath or Zeppelin song, can't pick just one. Thanks a ton! I really hope to finish Trinity before long. I'm terrible at holding onto things until they're waaaaaaaay overdue and borderline obsolete. I'm also totally incapable of picking a favorite Sabbath or Zeppelin song. I can narrow down to the album before I hit a brick wall. Where can I pick up this dreadful release on CD/vinyl? I've only seem the MP3 version. 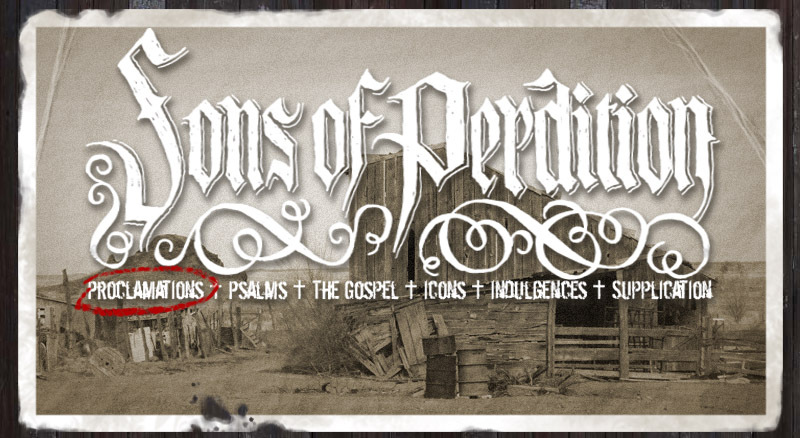 Is there any hope for a Sons Of Perdition and Those Poor Bastards collaboration album? "Psalms" is only available as MP3 for the foreseeable future. This will change, of course, when someone heaps enough cash on me to allow me to have records made. As for a collaboration album between myself and Those Poor Bastards, there's nothing planned but I wouldn't rule it out completely. They're great to work with. I'm actively working on "Trinity" now, though, and I already have the next album boiling over on the back burner. The next one is a collaboration of sorts, although not with Those Poor Bastards. Any chance of distributing "Psalms" digitally in FLAC (Free Lossless Audio Codec) format? Your music deserves the best and the best sound is lossless. I'll look into releasing songs in FLAC format. It's something I had thought about previously, but it didn't seem like anyone was interested.